The absence of universal definitions of vacancy and abandonment complicates efforts to assess the number of vacant and abandoned properties nationally. Vacant and abandoned properties are linked to increased rates of crime (particularly arson) and declining property values. The maintenance or demolition of vacant properties is a huge expense for many cities. It is critical to match strategies for combating vacancy to neighborhood market conditions. 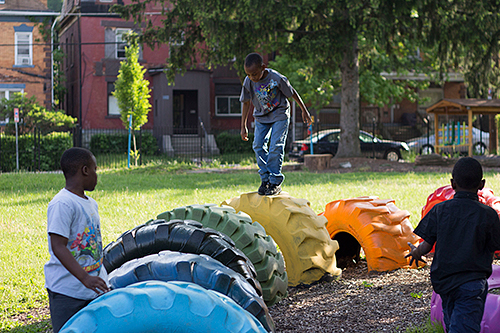 Vacant lots can be greened and repurposed for new uses, such as this play area in Pittsburgh’s East Liberty neighborhood. Photo courtesy: Sara Innamorato Derelict houses, dormant factories, moribund strip malls, and other types of vacant and abandoned properties are among the most visible outward signs of a community’s reversing fortunes. Properties that have turned from productive use to disuse are found in cities, suburbs, and rural areas throughout the country, and they vary widely in size, shape, and former use. But these vacant and abandoned properties are more than just a symptom of larger economic forces at work in the community; their association with crime, increased risk to health and welfare, plunging property values, and escalating municipal costs make them problems in and of themselves, contributing to overall community decline and disinvestment.1 Local government officials, community organizations, and residents, however, increasingly view vacant properties as opportunities for productive reuse, reimagining blight and dilapidation as urban farms, community gardens, and health facilities. To them, empty homes can become assets in neighborhood stabilization and revitalization that can be renovated and reoccupied. Vacant and abandoned properties have long plagued the industrial cities of America’s Rust Belt, but the spike in foreclosures following the recent recession has compounded problems for these areas and has caused vacancy rates to surge nationwide, especially in recently booming Sun Belt states such as Florida, Arizona, and Nevada. These communities face mounting blight and physical deterioration of properties, declining tax revenues, and rising public costs. Although nationwide factors (in particular, the foreclosure crisis) helped create these vacancies, local factors — the condition of the properties, the health of the local housing market, and the strength of the regional economy — are what shape the range of options available for returning these properties to productive use. The approach taken to reclaim one vacant property among many in a distressed Detroit neighborhood, for example, will be different from that taken to reclaim a property in a rebounding Phoenix suburb — or, for that matter, in another Detroit neighborhood with a healthy housing market. Local political and economic contexts, as well as limitations of capacity and resources, shape the tools that local governments, nonprofits, and neighbors employ to address and reuse vacant and abandoned properties. The most desired outcome is to quickly return a property to its previous use — an owner-occupied residence or a thriving business. However, tight credit, weak markets, population loss, or other factors may require other solutions such as demolition, conversion of owner- occupied housing to rental housing, or replacement (such as constructing a solar farm on a former industrial site). Strategies for reuse aim to stabilize and revitalize neighborhoods and may stimulate economic recovery and growth or, in the case of shrinking cities, manage decline in ways that improve quality of life for the remaining residents. Vacant and abandoned properties have negative spillover effects that impact neighboring properties and, when concentrated, entire communities and even cities. Research links foreclosed, vacant, and abandoned properties with reduced property values, increased crime, increased risk to public health and welfare, and increased costs for municipal governments. 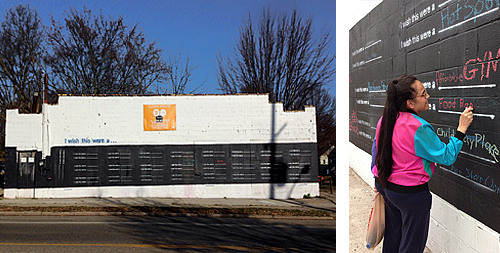 The “I Wish This Were A…” project in Lansing, Michigan invites community members such as the woman pictured above to reimagine use of this abandoned store. The Reinvestment Fund and the National Neighborhood Indicators Partnership have been critical resources for localities developing data tools and systems to track and address their vacant properties. In the city of Syracuse, New York, an IBM Smarter Cities team developed a forecasting model to help identify neighborhoods and properties at risk of vacancy-related problems and those in which an intervention would have the greatest impact. As the researchers put it, “The city’s goal is to move from decision-making based on ‘educated anecdotes’ and reactive strategies aimed at the most urgent need, to policy development based on informed, holistic insight, and proactive interventions that prevent and reverse decline,”38 (see “Targeting Strategies for Neighborhood Development”). As local officials learn of potential vacant and abandoned properties through registration, neighbor complaints, visual surveys, property tax delinquency, or other means, they typically turn first to code enforcement and tax liens to make owners take responsibility for the property and return it to productive use. Vacant and abandoned properties can quickly fall into enough disrepair that they no longer comply with local building codes. Code enforcement officials, who are empowered to secure properties that pose a threat to public health, safety, and welfare, can then issue citations and levy fines on problem properties.39 Successful early intervention is the best course of action because deterioration compounds quickly over time. One of the greatest obstacles to timely and effective code enforcement, according to Joseph Schilling, director of the Metropolitan Institute at Virginia Tech, is tracking down and holding responsible the owners and servicers of loans in default.40 Real estate owned (REO) properties pose special challenges. Mortgage servicers, which are usually national or international companies, must contend with the local laws and codes that apply to a given property. When officials can identify the property owners and hold them responsible, they can ensure that code violations are rectified and mitigate the negative impact of the property. If the owners are not responsive, local governments can take control of the property and pursue the appropriate course: either rehabilitation or demolition and reuse. Although neglected upkeep may be the most visible sign of vacancy (and one that is likely to result in a code violation), “property tax delinquency,” Alexander and Powell find, “is the most significant common denominator among vacant and abandoned properties.”41 When an owner stops paying property taxes, local governments initiate a tax-foreclosure process by placing a tax lien on the property. The lien is intended both to recover taxes owed and to prompt the owner to take responsibility for the property. Owners typically have the opportunity to pay off the lien, but the property reverts to the municipality if the owner has walked away from it. Both lost property tax revenues and reverted properties can pose problems for local governments, although the latter can also present an opportunity to exert some control over reuse of the property if the municipality is prepared to do so, such as through a land bank. Strategies for Stronger Markets. Stronger markets offer the possibility of keeping owner occupants in homes at risk of becoming vacant or quickly reoccupying homes that have already become vacant. Foreclosure prevention programs, rehabilitation for sale, or scattered-site rental housing are among the stronger market strategies that promise to reduce the inventory of vacant homes. Neighborhood marketing and commercial revitalization strategies can help these neighborhoods retain and attract residents by stimulating the demand necessary to reoccupy vacant homes. Some severely dilapidated vacant properties in these neighborhoods might still require demolition, but these typically would be single lots, which would provide opportunities for small-scale reuse such as side-lot adoption or community gardens. Because foreclosures are a major cause of vacancy in stronger markets, limiting them could go a long way toward stabilizing these neighborhoods. “Not all distressed borrowers can avoid losing their homes,” explains law professor and financial services expert Patricia A. McCoy, “but in appropriate cases — where modifications can increase investors’ return compared to foreclosure and the borrowers can afford the new payments — loan modifications can be a win-win for all.”48 Loan modification and refinancing programs, augmented by foreclosure counseling, aim to keep owner occupants in their homes. Major initiatives in foreclosure prevention include two federal programs: the Home Affordable Modification Program (HAMP) and the National Foreclosure Mitigation Counseling program (NFMC). HAMP has processed more than 1.2 million permanent loan modifications since 2009.49 HAMP participants have high rates of redefault, however, reaching 46 percent in 2013 for modifications initiated in 2009.50 A 2012 assessment of HAMP found that although the program led to a modest reduction in the rate of foreclosures, it reached only about a third of eligible households and had an adverse effect on loan renegotiations outside of the program.51 Mayer et al. find better results for NFMC, concluding that the program improved loan quality for participants, reducing monthly payments by 7.8 percent.52 By keeping owner-occupants in their homes, foreclosure prevention programs can avoid many of the problems such as code violations (the visible signs of neglect) that arise once a property becomes vacant. In partnership with community-based Operation Better Block’s Jr. Green Corps, Pittsburgh nonprofit GTECH Strategies engaged local youth to green this vacant lot in the Homewood neighborhood. 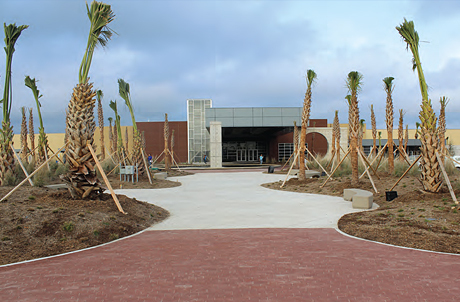 The community of McAllen, Texas reclaimed this abandoned big box store as a new home for its main public library. Strategies for Weak Markets and Shrinking Cities. In neighborhoods where housing markets are weak, where supply far exceeds demand, and in cities that are losing population, many of the strategies discussed above are unlikely to result in owner-occupied use of once-vacant properties. As Mallach and Brachman advise, “Cities such as Youngstown or Detroit, where 30 percent of their land areas are vacant — and which continue to lose population — need to think about land reutilization in fundamentally different ways than a city in which 10 percent or less of its land area is vacant, or where the city’s population appears to be stabilizing, such as Milwaukee or Newark.”64 Even cities with overall population stability or growth may still have neighborhoods or groups of neighborhoods in which markets cannot support revitalization strategies such as scattered-site rental housing or neighborhood marketing. The interventions that may be necessary to address vacant and abandoned properties in neighborhoods with weak markets and in shrinking cities include large-scale demolition and repurposing.68 Cities such as Buffalo, which in the 2000s conducted a “5 in 5” campaign to demolish 5,000 properties in 5 years, can barely keep up with the backlog of thousands of vacant properties.69 As noted above, demolition can be extremely costly. To aid state and local efforts to fund large-scale demolition, the U.S. Department of the Treasury has authorized the use of the Hardest Hit Fund (part of the Troubled Asset Relief Program) for demolition in 18 eligible states and the District of Columbia, although no funds had been expended for that purpose as of June 30, 2013.70 In Ohio, the attorney general chose to designate up to $75 million of the state’s share of the National Mortgage Settlement to reimburse counties for demolition. As of February 4, 2014, Ohio counties had expended over $65 million to demolish 8,390 units, with approximately $41 million of that total reimbursed by the attorney general.71 Although these funding sources are vital for communities struggling to keep up with demolition demands, they are not ongoing, so alternatives will be needed if large numbers of properties continue to be slated for demolition. Vacant and abandoned properties present daunting challenges to communities nationwide. Evidence shows that vacant and abandoned properties drag down local economies, impede population growth, depress property values, increase crime, and impose heavy cost burdens on local governments. 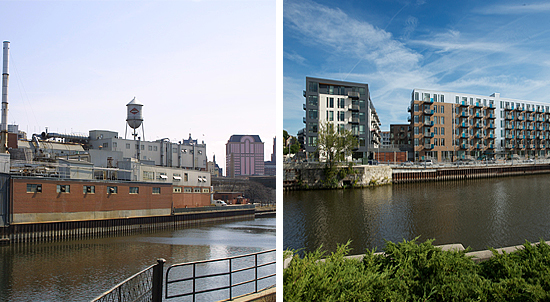 An example of successful brownfield redevelopment, the former Pfister & Vogel leather tannery (left) is now the site of The North End apartments along the Milwaukee River in downtown Milwaukee, Wisconsin (right). More research will be needed to empower policymakers, investors, and citizens to make evidence-based decisions on difficult choices, such as when to rehabilitate and when to demolish, whether to have a judicial or administrative foreclosure process, whether to convert a brownfield to an affordable housing development or a green space, or whether a particular area should pursue smart growth or smart decline. Innovative design techniques promise to expand the range of options for reuse. As practitioners experiment with creative new uses of formerly vacant and abandoned properties, researchers will need to evaluate strategies and determine which work and which do not, which are most cost effective, and which are most sustainable. More research will help decisionmakers become better equipped to turn problem properties into assets that will stabilize and revitalize neighborhoods and improve residents’ quality of life. John Accordino and Gary T. Johnson. 2000. “Addressing the Vacant and Abandoned Property Problem,” Journal of Urban Affairs 22:3, 302–3. Margaret Dewar and June Manning Thomas. 2013. “Introduction: The City After Abandonment,” in Margaret Dewar and June Manning Thomas, eds., The City After Abandonment, Philadelphia: University of Pennsylvania Press, 2. U.S. Government Accountability Office. 2011. 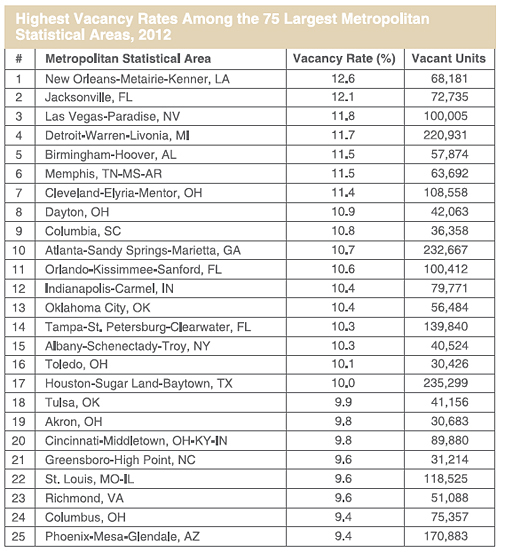 “Vacant Properties: Growing Number Increases Communities’ Costs and Challenges,” 9. Joint Center for Housing Studies. 2013. The State of the Nation’s Housing, 2013, Harvard University, 9. Elizabeth A. Duke. 2012. “Addressing Long-Term Vacant Properties to Support Neighborhood Stabilization,” speech at the Federal Reserve Bank of New York, 3. Joint Center for Housing Studies, 31–2. Justin B. Hollander, Niall G. Kirkwood, and Julia L. Gold. 2010. 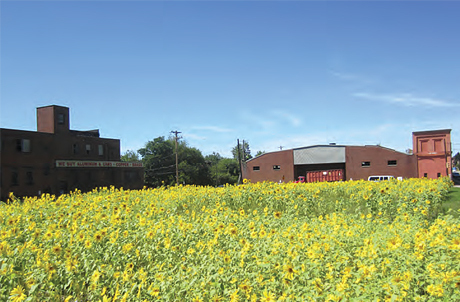 Principles of Brownfield Regeneration: Cleanup, Design, and Reuse of Derelict Land, Washington, DC: Island Press, 1, 4. Alan Mallach and Jennifer S. Vey. 2011. “Recapturing Land for Economic and Fiscal Growth,” Brookings-Rockefeller Project on State and Metropolitan Innovation, 1. Anastasia Loukaitou-Sideris. 1997. “Inner-City Commercial Strips: Evolution, Decay — Retrofit,” The Town Planning Review 68:1, 3–4; Daniel Hartley. 2013. “Urban Decline in Rust-Belt Cities,” Federal Reserve Bank of Cleveland; Michael D. Beyard, Michael Pawlukiewicz, and Alex Bond. 2003. “Ten Principles for Rebuilding Neighborhood Retail,” Urban Land Institute, iv. Justin Hollander, Colin Polsky, Dan Zinder, and Dan Runfola. 2011. 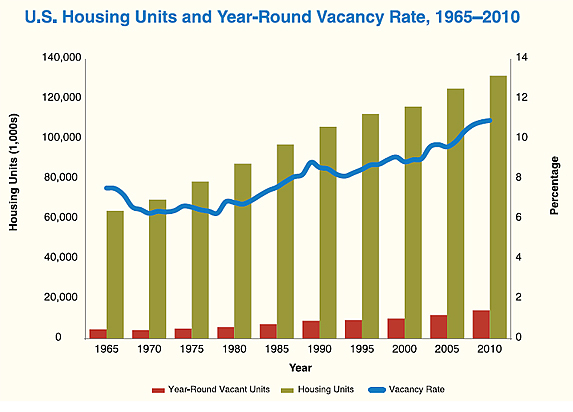 “A Spatial Analysis of Housing Vacancy in the United States – 2000-2011,” Lincoln Institute of Land Policy, 4; Margaret Dewar. 2009. “The Effects on Cities of ‘Best Practice’ in Tax Foreclosure: Evidence from Detroit and Flint,” CLOSUP Working Paper Series, No. 2, 1; Mallach and Vey, 1. Hye-Sung Han. 2013. “The Impact of Abandoned Properties on Nearby Property Values,” Housing Policy Debate, 4; Bill Barnes, Christina McFarland, and Caitlin Geary. 2011. “The Reign of Pain: Vacant and Abandoned Properties in Your Downtown,” South Dakota Municipalities, 24–5. U.S. Government Accountability Office, 14. Scott W. Frame. 2010. “Estimating the Effect of Mortgage Foreclosures on Nearby Property Values: A Critical Review of the Literature,” Economic Review: Federal Reserve Bank of Atlanta 95:3, 6–7; Dan Immergluck and Geoff Smith. 2006. “The External Costs of Foreclosure: The Impact of Single-Family Mortgage Foreclosures on Property Values,” Housing Policy Debate 17:1, 57; Zhenguo Lin, Eric Rosenblatt, and Vincent W. Yao. 2009. “Spillover Effects of Foreclosures on Neighborhood Property Values,” Journal of Real Estate, Finance, and Economics 38:4, 387. The lower estimate is from Immergluck and Smith and the higher one is from Lin, Rosenblatt, and Yao. Brian A. Mikelbank. 2008. “Spatial Analysis of the Impact of Vacant, Abandoned and Foreclosed Properties,” Federal Reserve Bank of Cleveland, 2. Stephan Whitaker and Thomas J. Fitzpatrick IV. 2012. “Deconstructing Distressed-Property Spillovers: The Effects of Vacant, Tax-Delinquent, and Foreclosed Properties in Housing Submarkets,” Federal Reserve Bank of Cleveland, 24. The broken window theory gained wide audience in George L. Kelling and James Q. Wilson. 1982. “Broken Windows: The Police and Neighborhood Safety,” The Atlantic Monthly 249:3, 29–38. Ashley N. Arnio, Eric P. Baumer, and Kevin T. Wolff. 2012. “The Contemporary Foreclosure Crisis and US Crime Rates,” Social Science Research 41:6, 1599–1600. Lin Cui. 2010. “Foreclosure, Vacancy and Crime,” Department of Economics, University of Pittsburgh, 23. Charles C. Branas, David Rubin, and Wensheng Guo. 2012. “Vacant Properties and Violence in Neighborhoods, International Scholarly Research Network: Public Health 2012, 5. U.S. Fire Administration. 2010. “Vacant Residential Building Fires,” Topical Fire Report Series 11:3, 1. Benton C. Martin. 2010. “Vacant Property Registration Ordinances,” Real Estate Law Journal 39:1, 12–3. Econsult Corporation, Penn Institute for Urban Research, and May 8 Consulting. 2010. “Vacant Land Management in Philadelphia: The Costs of the Current System and the Benefits of Reform,” Redevelopment Authority of the City of Philadelphia, 9, 11. William C. Apgar, Mark Duda, and Rochelle Nawrocki Gorey. 2005. “The Municipal Cost of Foreclosures: A Chicago Case Study,” Homeownership Preservation Foundation, 23. U.S. Government Accountability Office, 37–8. Bob Winthrop and Rebecca Herr. 2009. “Determining the CO$T of Vacancies in Baltimore,” Government Finance Review 25:3, 39. GSBS Richman Consulting. 2013. “Addressing Vacant & Abandoned Buildings in Oklahoma City: Prevalence, Costs + Program Proposal,” 12. U.S. Government Accountability Office, 39–40. Ibid., 69; Carolina K. Reid. 2010. “Shuttered Subdivisions: REOs and the Challenges of Neighborhood Stabilization in Suburban Cities,” REO & Vacant Properties: Strategies for Neighborhood Stabilization, eds. Prabal Chakrabarti, Matthew Lambert, and Mary Helen Petrus, Federal Reserve Banks of Boston and Cleveland and the Federal Reserve Board, 23–4. Roberta F. Garber, Jung Kim, Kerry Sullivan, and Eben Dowell. 2008. “$60 Million and Counting: The Cost of Vacant and Abandoned Properties to Eight Ohio Cities,” Community Research Partners, 3-3. Kathryn L.S. Pettit and G. Thomas Kingsley. 2011. “Framework: The New Potential for Data in Managing Neighborhood Change,” in Putting Data to Work: Data-Driven Approaches to Strengthening Neighborhoods, eds. Matt Lambert and Jane Humphreys. Board of Governors of the Federal Reserve System, 27–8. For more on vacant property registration ordinances, see Yun Sang Lee, Patrick Terranova, and Dan Immergluck. 2013. “New Data on Local Vacant Property Registration Ordinances,” Cityscape: A Journal of Policy Development and Research 15:2, 259–66; Martin, 6–43. Joseph Schilling. 2009. “Code Enforcement and Community Stabilization: The Forgotten First Responders to Vacant and Foreclosed Homes,” Albany Government Law Review 2, 127, 131. Sheila U. Appel, Derek Botti, James Jamison, Leslie Plant, Jing Y. Shyr, and Lav R. Varshney. Forthcoming. “Predictive Analytics can facilitate proactive property vacancy policies for cities,” Technological Forecasting and Social Change, 2. Corrected proof available at www.sciencedirect.com/science/article/pii/S0040162513002138. Accessed 1 February 2014. Keith H. Hirokawa and Ira Gonzalez. 2010. “Regulating Vacant Property,” The Urban Lawyer 42:3, 627–37, 629. Frank S. Alexander and Leslie A. Powell. 2011. “Neighborhood Stabilization Strategies for Vacant and Abandoned Properties,” Zoning and Planning Law Report 34:8, 3. William Weber. 2013. “Tax Foreclosure: A Drag on Community Vitality or a Tool for Economic Growth?,” University of Cincinnati Law Review 81:4, 1628–30. Sarah Treuhaft, Kalima Rose, and Karen Black. 2010. “When Investors Buy Up the Neighborhood: Preventing Investor Ownership from Causing Neighborhood Decline,” PolicyLink, 6, 24, 28–9; O. Emre Ergungor and Thomas J. Fitzpatrick IV. 2011. “Slowing Speculation: A Proposal to Lessen Undesirable Housing Transactions,” Forefront, Federal Reserve Bank of Cleveland. Dale E. Thomson. 2013. “Targeting Neighborhoods, Stimulating Markets: The Role of Political, Institutional, and Technical Factors in Three Cities,” in The City After Abandonment, 104. George Galster, Peter Tatian, and John Accordino. 2006. “Targeting Investments for Neighborhood Revitalization,” Journal of the American Planning Association 72:4, 458. Patricia A. McCoy. 2013. “Barriers to Foreclosure Prevention During the Financial Crisis,” Arizona Law Review 55: 3, 725. U.S. Department of Housing and Urban Development. 2013. “The Obama Administration’s Efforts to Stabilize The Housing Market and Help American Homeowners: December 2013,” 1. Office of the Special Inspector General for the Troubled Asset Relief Program. 2013. “Quarterly Report to Congress,” SIGTARP (July 24, 2013), 161. Sumit Agarwal, Gene Amromin, Itzhak Ben-David, Souphala Chomsisengphet, Tomasz Piskorski, and Amit Seru. 2012. “Policy Intervention in Debt Renegotiation: Evidence from the Home Affordable Modification Program,” National Bureau of Economic Research, ii. Neil Mayer, Peter A. Tatian, Kenneth Temkin, and Charles A. Calhoun. 2012. “Has Foreclosure Counseling Helped Troubled Homeowners? : Evidence from the Evaluation of the National Foreclosure Mitigation Counseling Program,” Metropolitan Housing and Communities Center, 4. Danilo Pelletiere. 2010. “Embracing Renting to Accelerate Neighborhood Recovery,” Chakrabarti et al.,137. Ivan Levi. 2009. “Stabilizing Neighborhoods Impacted by Concentrated Foreclosures: Scattered-Site Rental Housing Challenges and Opportunities,” NeighborWorks America, 13. U.S. Department of Housing and Urban Development. 2010. “HUD Secretary Announces National First Look Program to Help Communities Stabilize Neighborhoods Hard-Hit by Foreclosure,” 1 September press release. The Neighborhood Stabilization Program is a federal program, funded in three phases, designed to aid local governments in responding to the foreclosure crisis. Activities include purchase, rehabilitation, demolition, and reuse of foreclosed and vacant properties. See Paul A. Joice. 2011. “Neighborhood Stabilization Program,” Cityscape: A Journal of Policy Development and Research 13:1, 136–8. Greater Milwaukee Foundation. 2012. “Healthy Neighborhoods Initiative: 2012 Highlights,” 3. “NeighborWorks America Announces New Neighborhood Marketing and Branding Initiative to Help Communities Hurt by the Housing Crisis Attract New Investment and Residents,” 26 July 2012 press release. Alan Mallach. 2012. “Laying the Groundwork for Change: Demolition, Urban Strategy, and Policy Reform,” Brookings Metropolitan Policy Program, 3–5, 29; Kent State University, Cleveland Urban Design Collaborative. 2009. “Re-imagining Cleveland: Vacant Land Re-use Pattern Book,” Neighborhood Progress, Inc., 14, 17, 26. On crime and health see Eugenia C. Garvin, Carolyn C. Cannuscio, and Charles C. Branas. 2012. “Greening Vacant Lots to Reduce Violent Crime: A Randomised Controlled Trial,” Injury Prevention 2013:19, 198; and on property values see Susan M. Wachter, Kevin C. Gillen, and Carolyn R. Brown. 2008. “Green Investment Strategies: A Positive Force in Cities,” Communities & Banking 19:2, 24–7. Ioan Voicu and Vicki Been. 2008. “The Effect of Community Gardens on Neighboring Property Values,” Real Estate Economics 36:2, 241–83, 243. Alan Mallach and Lavea Brachman. 2010. “Shaping Federal Policies Toward Cities in Transition: A Policy Brief,” Greater Ohio Policy Center, 6. Margaret Dewar, Christina Kelly, and Hunter Morrison. 2013. “Planning for Better, Smaller Places After Population Loss: Lessons from Youngstown and Flint,” in The City After Abandonment, 291. Brent D. Ryan. 2013. “Rightsizing Shrinking Cities: The Urban Design Dimension,” in The City After Abandonment, 268, 282–3. U.S. Environmental Protection Agency. 2013. “On the Road to Reuse: Residential Demolition Bid Specification Development Tool,” 5. Office of the Special Inspector General for the Troubled Asset Relief Program. 2013. “Quarterly Report to Congress,” SIGTARP (October 29, 2013), 99–100. Ohio Attorney General. 2013. “Attorney General Extends Deadline for Counties to Apply for Demolition Funds,” 29 August press release; Interview with Matt Lampke, Mortgage Foreclosure Counsel, 4 February 2014. Detroit Works Project. 2012. Detroit Future City: Detroit Strategic Framework Plan, Detroit Works Project,93, 99, 103, 116, 117. Nancy Stoner, Christopher Kloss, and Crystal Calarusse. 2006. “Rooftops to Rivers: Green Strategies for Controlling Stormwater and Combined Sewer Overflows,” Natural Resources Defense Council, 1, 4. Hollander, Kirkwood, and Gold, 54–5. Dewar and Thomas 2013, 7–10. Interview with Alan Mallach, 13 November 2013. Interview with Justin Hollander, 12 November 2013.